Counter top convection oven with steaming capability. 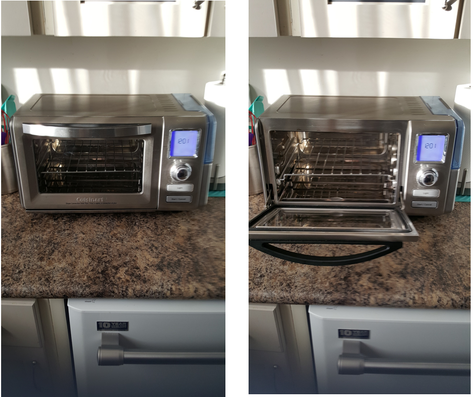 9 single and combo functions; bread, bake convection or bake steam, broil or broil steam, steam or super steam and keep warm. Fits a 12" pizza or whole chicken. Includes: broil pan, crumb tray, drip tray, roasting rack, wire rack, water container, and including two Wilton non-stick pans. 15” D incl handle, 19” W & 11” H. Instruction/recipe booklet. Only 2 years old - retails new for $349.99.